Mix the rice and vegetable broth in a pot, and bring to a boil. Reduce heat to low, cover, and simmer 45 minutes, or until rice is tender. Preheat oven to 350 degrees. Lightly grease a large 9x13" casserole dish. Heat the olive oil in a skillet over medium heat, and cook the onion until tender. Mix in the zucchini, chicken, and mushrooms. Season with cumin, salt, and ground cayenne pepper. Cook and stir until zucchini is lightly browned and chicken is heated through. 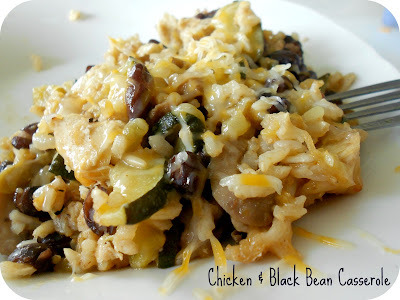 In large bowl, mix the cooked rice, onion, zucchini, chicken, mushrooms, beans, chiles, and 1/2 the cheese. Transfer to the prepared casserole dish, and sprinkle with remaining cheese. Cover casserole loosely with foil, and bake 30 minutes in the preheated oven. Uncover, and continue baking 10 minutes, or until bubbly and lightly browned.